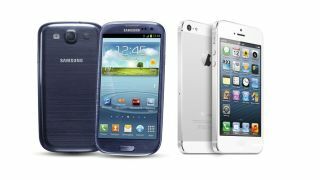 The iPhone and some Samsung Galaxy devices may be about to get some Pentagon love as the US Department of Defense is expected to grant security approvals, allowing the US military to purchase them. This would allow several government agencies to use Samsung Galaxy smartphones running on "Knox", as well as iPhones and iPads running the latest iOS. It's unlikely to have a big immediate effect on global sales, but the security endoresement will still be a big win for Samsung and Apple. BlackBerry has been Pentagon-approved for a long time, and currently 470,000 of the Pentagon's 600,000 smartphone owners use the BlackBerry device. The Apple and Android devices are typically used to run test programmes. But the approval could spell bad news for BlackBerry, which has prided itself on its image as being the go-to security device. "We are working towards establishing a multi-vendor environment that supports a variety of devices and operating systems, to include Samsung, Apple and BlackBerry," Pentagon spokesman Lieutenant Colonel Damien Pickart told Reuters. "A key objective of the plan is to establish a department-wide mobile enterprise solution that permits the use of the latest commercial technology such as smartphones and tablets." A full review for the devices is expected in May. This will include the iPhone 4, iPhone 5, iPad and iPad mini.